New Wave Domesticity: Thai Curry Corn Chowder! The air is starting to get a chill and the rainy season is coming in with a vengeance. It's the time of year to cuddle up under blankets with a good book. It's also the time of year to when few things really hit the spot for me like a big warm bowl of soup. Soup is such a versatile thing that is ripe with endless possibilities. Soup season is a time to get creative and find new ways to break out the stockpot and experiment with finding that perfect match up of flavors and textures that just hit that spot right down in your soul. 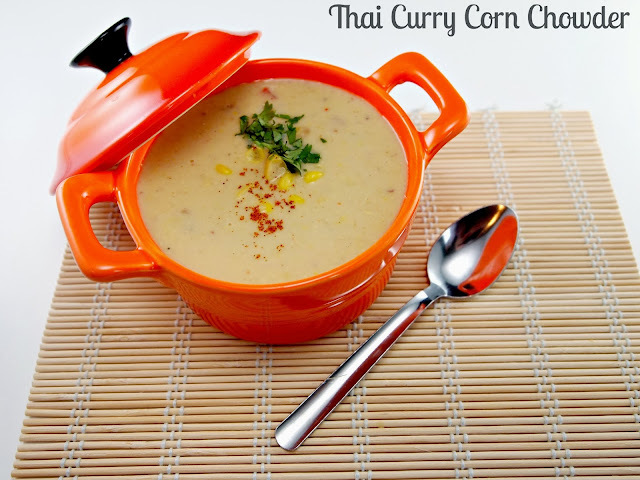 This week, I happen to have found one of my new favorite comfort foods - Thai style curry corn chowder. It combines two of my greatest loves (classic corn chowder + curry) into a dynamic, spicy, creamy bowl that is sure to warm even the coldest of nights. I will never look at corn chowder the same! Obviously coconut milk is a tried and true paring for curry because it adds that sweet creaminess that cuts the spice just a bit and makes it balance. Add some sweet corn & potatoes, and you are in for a bowl of magic. I am sometimes a little overwhelmed by heavy cream-based soups, so I really love that this recipe substitutes the traditional heavy cream in corn chowder for coconut milk and you really don't miss the dairy one bit. The coconut milk creates a beautiful thick, sweet creamy texture when your puree it with the corn and potatoes that is just about identical to the traditional American recipe. It's hearty and filling without being so overwhelming. The fish sauce is added to pair with the curry take the sweet corn and coconut milk flavor down to a more savory and complexly layered flavor in the soup. Cut the corn kernels of the cob (here's a tip to make that a cinch!). Add your stock to a large pot and bring it up to a simmer. Meanwhile, in a saute pan, add butter and saute all your veggies for about 10 minutes until they brown up and get soft. Add 1/2-3/4 of your vegetables, the coconut milk, fish sauce, and curry to the stock. The fish sauce adds a savory element to the sweet corn and coconut milk, but you can omit that if you want a sweet soup. Simmer for about 10 minutes. Use a stick blender or food processor and blend your soup until you get nice smooth consistency. Add the remaining vegetables to add texture. Cook for another 5 minutes. Garnish with cilantro and/or jalapenos. You can also add shrimp or shredded chicken if you'd like, but I found it just perfectly hearty without the meat. It reheats really nicely, so it's a perfect make ahead meal or you can freeze individual portions. Enjoy! What are your favorite fall/winter comfort foods? This sounds yummy and looks beautiful! You blow me away with your cooking skills.